​In my book, Scar of the Downers, one of my main characters, Crik, is a slave, who longs for freedom, but is too frightened to seek it for himself. Despite the abuse he received all of his life, he never moved from his spot, his situation. There was always fear that held him back. Without giving away the plot points for those who haven’t read it yet, I will say that help for him came from an unexpected source. He had an unexpected companion. While success always brings out millions of supporters, the road to it is often lonely. ​I can say that along the road to getting published (and along the road of life), I come across unexpected companions as well. Who hasn’t? There were people you thought that would be there and support you along the way, but you later found they weren’t. And then there were people you didn’t know existed, but found them to be some of your greatest supporters – your greatest friends. Depending on who you focus on, this can either be seen as the greatest disappointment or the greatest blessing. This is the type of journal we probably all have, but should get rid of. ​While success always brings out millions of supporters, the road to it is often lonely. But it is on this road you find who your friends are. Sometimes they are exactly who you thought they’d be, and sometimes they are not. ​If you’re not careful, however, this realization can make you stumble. It’s easy to focus on the expectation that didn’t happen. It’s understandable. I get that because I do that. But in the end, it won’t get you anywhere. It won’t change anything or anyone, except for you. You’ll find yourself a bit more cynical, a bit more bitter, a bit angrier. You didn’t sell the amount of copies of your book you wanted to – BUT you did sell some. You thought a friend would be there for you in a time of trouble – BUT you discover your spouse was there instead. ​That is the thing. In life, you have to look for the good. It’s there, somewhere, even if it’s hiding. And sometimes, it is in plain sight. We can’t let the things or people of this world make you lose sight of the blessings God has brought into your life. I could spend my life angry about not finding a full-time job. But if I did that, I would miss the laughter of my children during the day. A job is nothing compared to my children. Yes, I could lament that I am not saving or investing for retirement. Instead, I am investing in life. Children, not money, is my inheritance. ​We can be so focused on what we don’t have, we neglect the better things. Take stock of what you have and who is there and forget all the rest. I’m sure if you look at your life you can find those unexpected companions that have aided you. They should be praised, not overlooked. Yes, Crik could focus on the slavery he had endured. He could be bitter over the life he experienced and the people who enslaved him and treated him poorly. Or, he could rejoice that he is now free! He could thank those who helped gain his freedom. 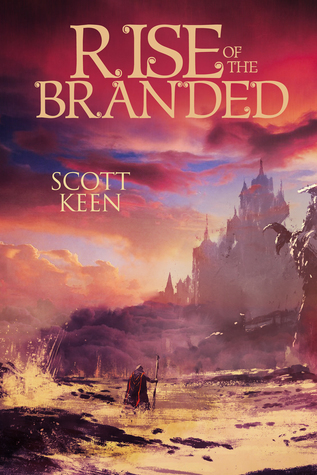 Last week, my second book, Rise of the Branded, was released. You can enter the Goodreads giveaway for a chance to win a copy of it. The first book, Scar of the Downers, is available to buy at Amazon, Wal-Mart, Barnes & Noble, or at the local bookstore. Giveaway ends December 21, 2016.